Posted on April 12, 2016 by Barry V.
An ice storm in recent days has left the ground littered with broken branches, some piled along the sanctuary trails for removal. I realize it’s a good opportunity to get a close looks at twigs and terminal buds that are normally high overhead. A big sassafras as the edge of the meadow has lost a number of good sized branches, so I comb over them, looking for particularly interesting twigs and buds. The thick, curved twigs are a rich mustard color and the large buds are suffused with pink and olive. I break off a few twigs, and put them in my pack. I had learned from staff members that great horned owls have been frequenting a grove of pines near the intersection of the Fern and Red Maple Trails, and may have a nest there. I find the grove of big pines (which looks like a perfect place for a great horned nest) and give the area a thorough search. I find one suspicious clump of twigs and branches halfway up a pine trunk, but it doesn’t look big enough to support a Great Horned Owl nest. Perhaps it’s the beginning of a nest? I set up my pack chair at a distance, then settle down and take out my sassafras twigs and sketchbook. 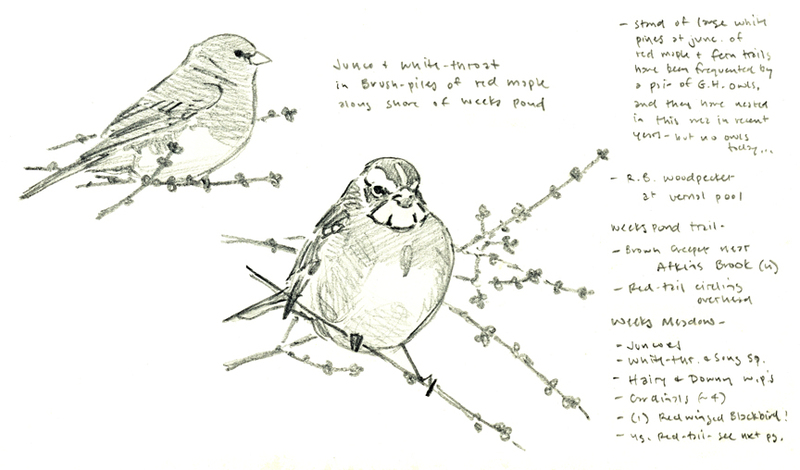 I’m hoping I might see or hear an owl while I’m quietly drawing and painting the twigs. Great Horned Owls are the earliest native birds to nest in our region, laying eggs as early as mid-February, and incubating them through late February and into March. If a pair is in the area, they should be well into the nesting cycle. 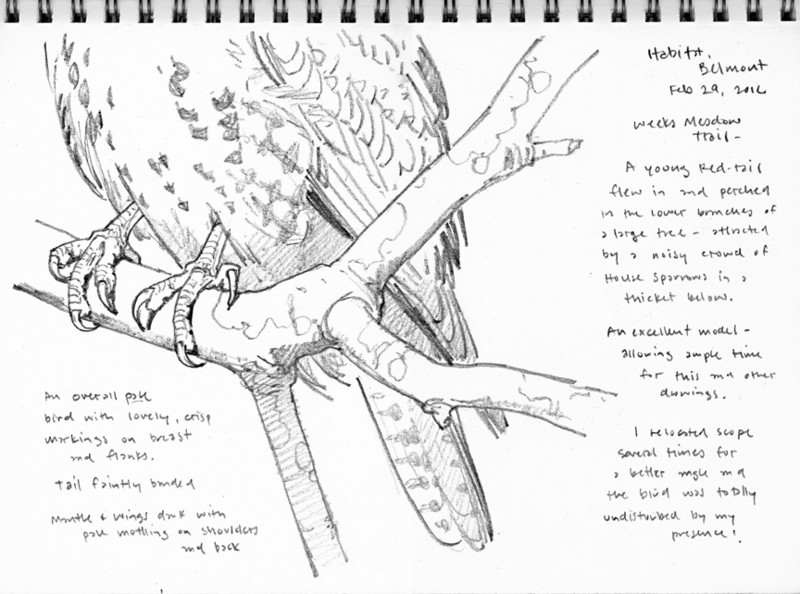 I have had only one opportunity to observe and draw a Great Horned Owl on a nest, and that was in Northboro, Massachusetts in April 2011. That nest was also in a big white pine, and if I positioned my scope just right, I got clear views of the adult on the nest. I was hoping for a similar opportunity at Habitat, but it was not to be. I saw or heard no owls today. 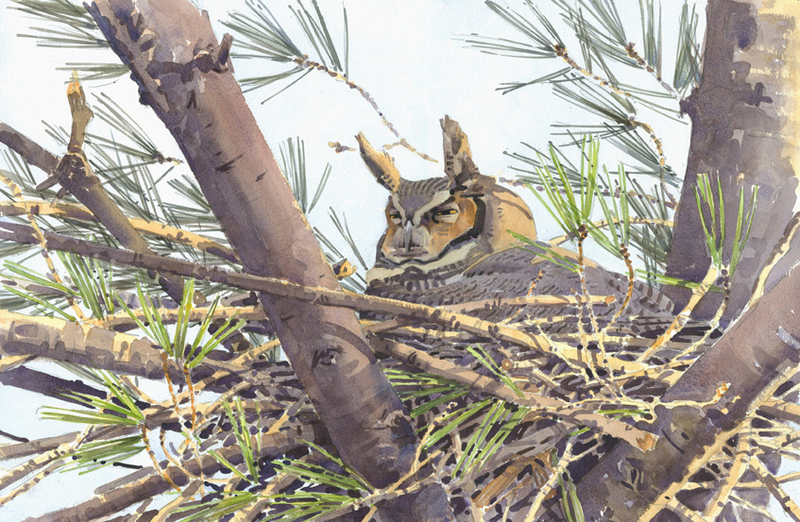 I include my painting of the Northboro owl here, since a nest in the pine grove at Habitat would have looked very similar. 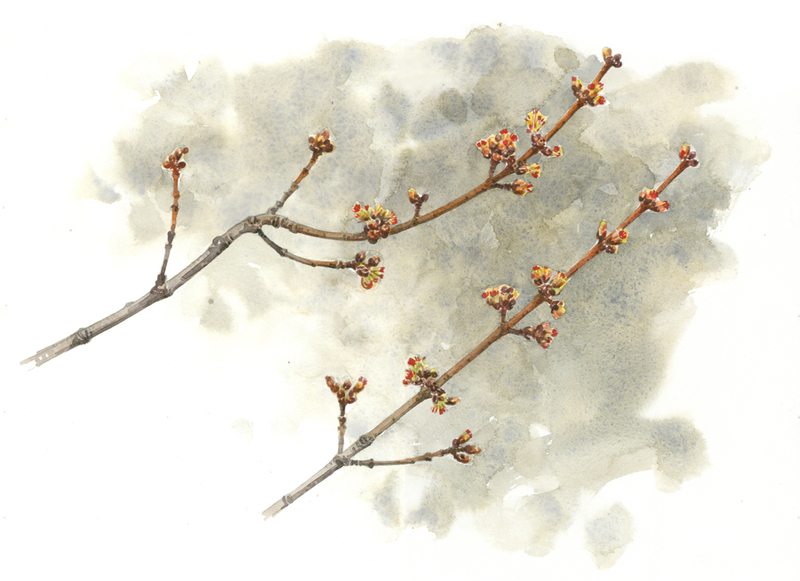 Piles of red maple branches around the pond again allow me close looks at the terminal buds, and I collect more twigs. Back in my studio, I put them in a vase of water, and a week later the buds started to open, so I painted them from life at my drawing board. Are there more red-tailed hawks around these days, or is it just me? I’m watching a hairy woodpecker at Weeks Meadow when a big bird swoops in to land in the lower branches of a nearby tree. It’s a handsome young red-tail, attracted to a noisy mob of house sparrows in the thicket below. The bird is MUCH closer than the one I observed at Pierpont Meadow (see Beavertowns, Feb 1, 2016). 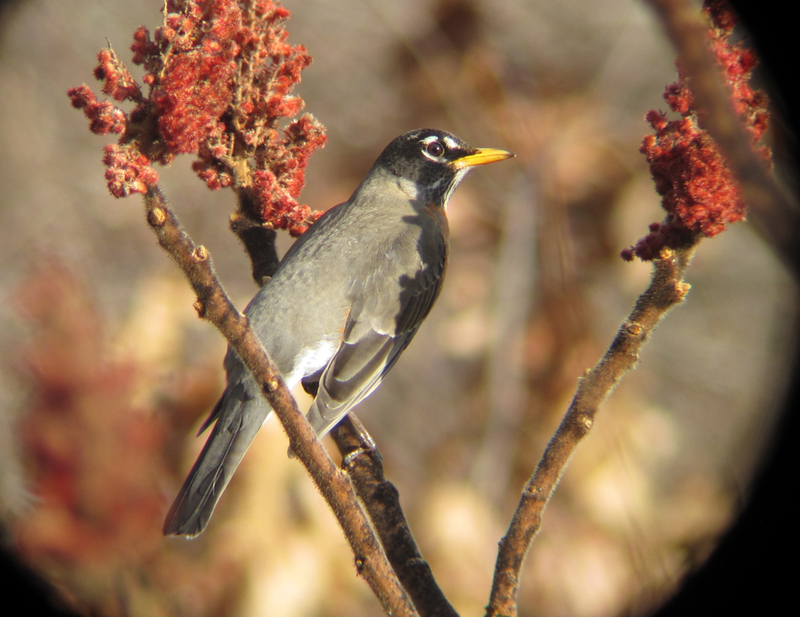 With my scope, I can see every detail of its plumage and anatomy with startling clarity. On a raptor, the two points of high drama are the face and the feet. For a while this bird’s head is obscured by a branch, but I’ve got great views of its feet and lower body, and decide to start a drawing. 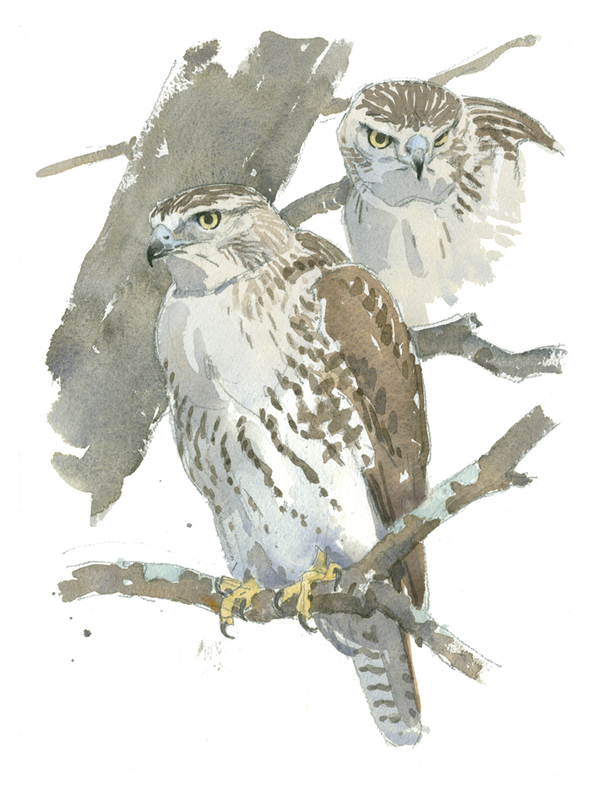 Later, the bird shifts and I have a view of the whole bird – that’s when I start this watercolor on a separate sheet. Young birds, being rather clueless, can be excellent models. I’m in full view of the bird, and though I move myself and the scope several times to get better views, the bird seemed totally oblivious to my presence! 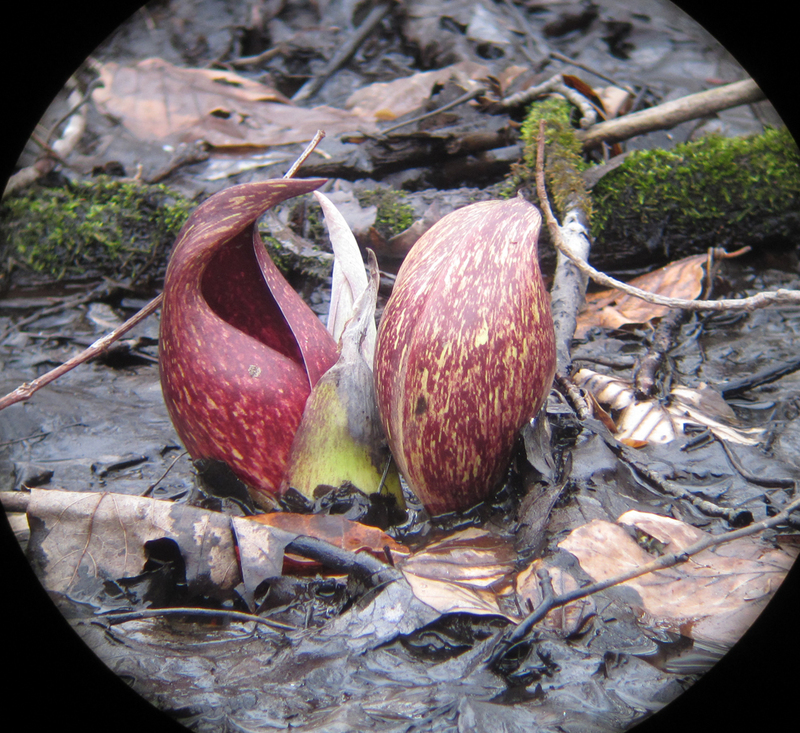 This entry was posted in Artists, Barry Van Dusen Residency, News and tagged American robin, brown creeper, Fern Trail, great horned owl, Habitat, Hairy woodpecker, Red Maple Trail, Red-tailed hawk, red-winged blackbird, Sassafras, skunk cabbage, Songbird, terminal buds, Twigs, wet swale on April 12, 2016 by Barry V..